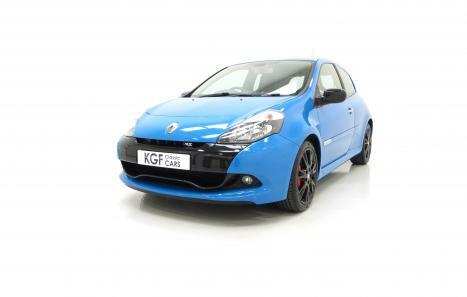 A thrilling Clio Renaultsport 200 Cup Chassis with one owner and 27,569 miles. Black gloss front bumper and rear air diffuser, twin exhausts, extended front wings with air extractors, auto ‘see me home’ headlights, auto wipers, gearshift indicator light and sound, yellow Renaultsport rev counter, multi-function trip computer, ESC with 100% disconnection function, cruise control, speed limiter, climate control, electric heated door mirrors, electric windows with one touch, keycard, ISOFIX, Factory Options: Renaultsport Recaro seats, Cup Chassis, Black Speedline alloy wheels. 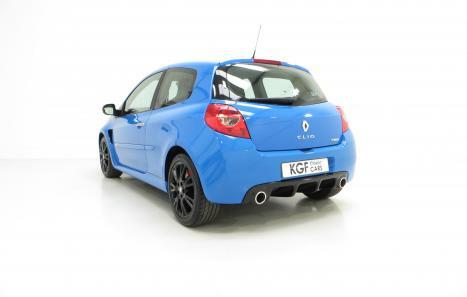 This Clio Renaultsport 200 has an aggressive appearance with F1-style frontal aerodynamics and a rear diffuser and looks stunning finished in Racing Blue, (Code J45). The paint boasts a uniform gleam and evidence of a one mature careful owner from new is quickly apparent from the excellent condition. Some tiny stone chips to the front and a light mark to the tailgate help establish the honest credentials of these often abused cars. 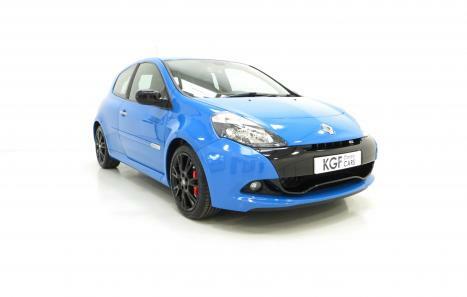 The Black Gloss to the exterior trim is stunning and contrasts beautifully against the Racing Blue colour scheme. The exterior satin chrome door handles are perfect and the rear screen is still fitted with the Renault stickers including the Euro NCAP 5 Star rating. Unmolested and a sheer joy. The desirable expensive and optional Renaultsport Recaro front seats priced at £808.33 when new are amazing both in support and condition. The drivers bolster protrudes resulting in even very low mileage examples suffering from wear, but this car has virtually none, thanks to the only owner from new carefully entering and exiting the car with full knowledge of this fact. The sense of occasion and anticipation once in the drivers seat is quickly felt with features such as the drilled aluminium pedals, yellow rev counter and start button and everything is spotlessly clean and operational. Renaultsport carpet mats have been fitted and the stainless door sills displaying the logo are unmarked. The door shuts sparkle. This really is a cherished and very special car. The 2.0 VVT 200 engine is a marvel combined in a car weighing just 1240kgs and fitted with the Cup Chassis. Performance figures of 0-62mph in 6.9 seconds and a top speed of 141mph are quoted but the thrill is in the track-focused driving dynamics that make this car a must drive. Full Renault Main Dealer servicing has been enjoyed from new with the last visit made in November 2018. The engine bay is standard and immensely clean. The 6-speed gearbox offers short positive movements to capitalise on the engine power band. Optional 17” Speedline alloy wheels in Black are virtually unmarked and help make a feature the Red painted Brembo brake calipers. All four corners are shod in premium brand tyres with ample tread. Powerful disc brakes front and rear, Anti-lock Brake System, (ABS) and Electronic Brake-force Distribution (EBD), provides low fade high performance stopping power. The rear pads and discs were replaced in April 2019. Supplied new on the 16th July 2011 by Renault Main Dealers, the Crawley Down Group to the one and only private owner, Mr Nigel Arnold. 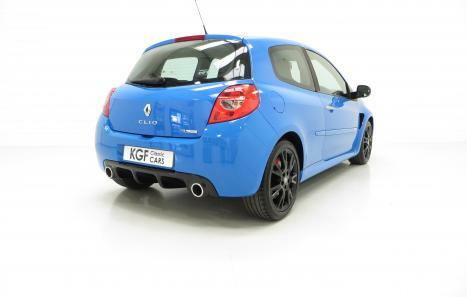 After a 48hr test drive he had to buy one and the New Vehicle Invoice reveals a price paid £18,824.36 which included the important Cup Chassis and Renaultsport Recaro seats. Mr Arnold has cherished this Hot Hatch only ever returning to the Renault Main Dealer for scheduled service work and the history file is complete with invoices and Renault Vehicle Health Checks. The last service was carried out in November 2018. All purchase literature has been retained including the My Renault box kit with a sealed unused Renault branded cleaning cloth! Two keycards, a full handbook pack and new car sales brochure completes the whole package of one very special car and stunning history file.